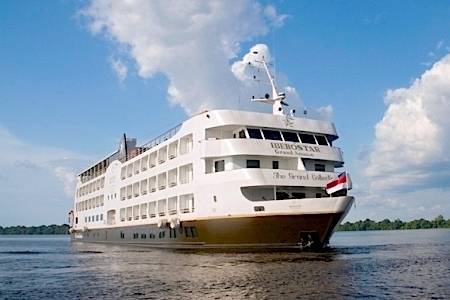 Types of Cabin: Mandi Deck: 4 Twin & 10 Double cabins (one of which is wheelchair accessible); Tambaqui Deck: 11 Twin, 18 Double cabins & 2 Royal Suites; Acará Deck: 11 Twin & 18 Double cabins. That makes 26 Twin & 48 Double cabins in total. Interconnectable Cabins: Yes, there are 4 cabins on each deck which can interconnect in pairs, always a double cabin combined with a twin. These are cabins 105 & 107, 110 & 112, 209 & 211, 222 & 224, 309 & 311 and 323 & 325. Bathrooms: Private ensuite facilities with shower, hot water, hairdryer, soap, shampoo, and other amenities. Royal Suites have a Jacuzzi bath with built-in shower. Top tip: The cabins on the Iberostar Grand Amazon cruise (with the exception of the Royal suites) are all the same size and have all the same features. The only difference is the location on the boat. In general, the higher the deck, the better the views and the lower the engine noise. Size: 247.5 Sq. Ft. = 23 Sq. Mt. Beds: Twin double beds or one king-sized bed depending on cabin selection/availability. 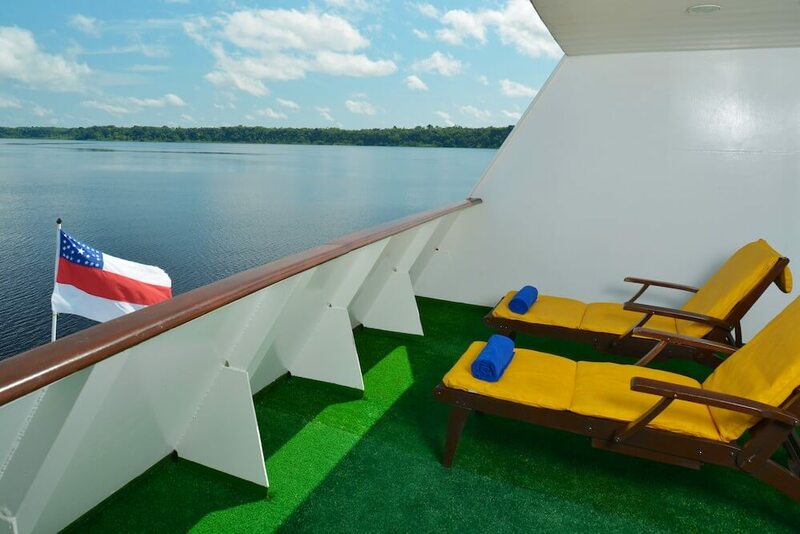 Balcony: Yes, all cabins feature private balconies. 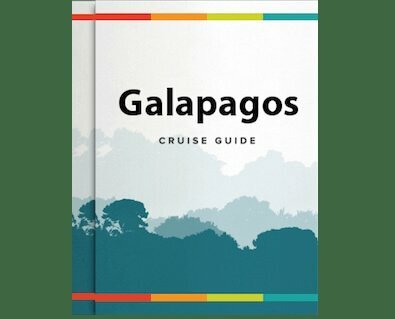 Features: Each cabin comes with telephone, radio, TV showing films & documentaries, 110V electricity, dehumidifier, safe and fully-stocked minibar. Room service is also included from 11:00am - 11:00pm. 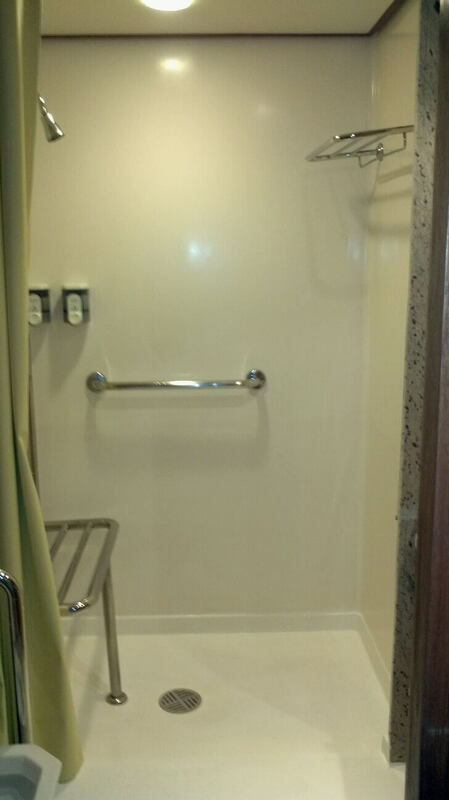 Features: Cabin 102 on Mandi Deck is the only wheelchair-accessible cabin on the Iberostar. It features widened doorways, less furniture, a roll-in shower and extra hand rails in the bathroom to allow for greater access. Size: 538 Sq. Ft. = 50 Sq. Mt. 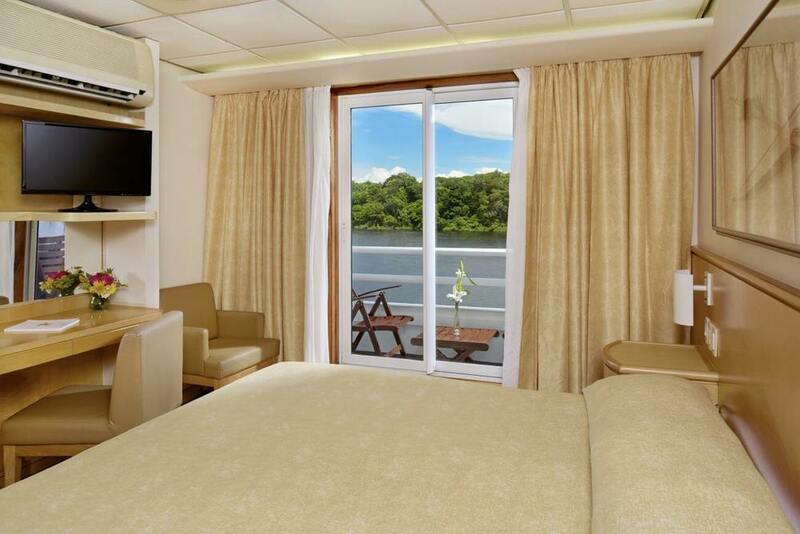 Balcony: Yes, the Royal Suites have extra large balconies at the prow of the ship that include sun loungers. Features: Each cabin comes with telephone, radio, TV showing films & documentaries, 110V electricity, dehumidifier, safe and fully-stocked minibar. Room service is also included from 11:00am - 11:00pm. The Royal Suites also include a comfortable lounge area with kitchenette, sofa, TV and dining table.